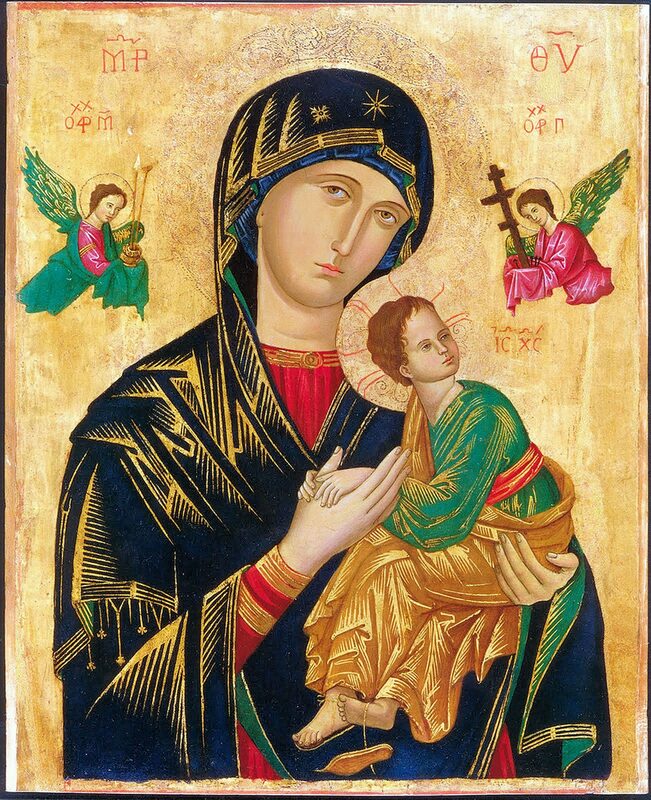 The image of Our Lady of Perpetual Help is an icon, painted on wood, and seems to have originated around the thirteenth century. Traditionally, the image is also known as “Our Lady of Perpetual Succour.” The icon (about 54 x 41.5 centimeters) depicts our Blessed Mother Mary, under the title “Mother of God,” holding the Child Jesus. The Archangels Michael and Gabriel, hovering in the upper corners, hold the instruments of the Passion– St. Michael (in the left corner) holds the spear, the wine-soaked sponge, and the crown of thorns, and St. Gabriel (in the right corner) holds the cross and the nails. The intent of the artist was to portray the Child Jesus contemplating the vision of His future Passion. The anguish He feels is shown by the loss of one of His sandals. Nevertheless, the icon also conveys the triumph of Christ over sin and death, symbolized by the golden background (a sign of the glory of the resurrection) and the manner in which the angels hold the instruments, i.e. like trophies gathered up from Calvary on Easter morning. In a very beautiful way, the Child Jesus grasps the hand of the Blessed Mother. He seeks comfort from His mother, as He sees the instruments of His passion. The position of Mary’s hands– both holding the Child Jesus (who seems like a small adult) and presenting Him to us– convey the reality of our Lord’s incarnation, that He is true God who became also true man. In iconography, Mary here is represented as the Hodighitria, the one who guides us to the Redeemer. She also is our Help, who intercedes on our behalf with her Son. The star painted on Mary’s veil, centered on her forehead, highlights her role in the plan of salvation as both the Mother of God and our Mother. Once in Rome, the merchant, dying, ordered that the image should be displayed for public veneration. His friend, who retained the image, received further instructions: in a dream to his little daughter, the Blessed Mother appeared and expressed the desire for the image to be venerated in a Church between the Basilicas of St. Mary Major and St. John Lateran in Rome. The image, consequently, was housed at the Church of St. Matthew, and became known as “The Madonna of Saint Matthew.” Pilgrims flocked to the church for the next three hundred years, and great graces were bestowed upon the faithful. After Napoleon’s troops destroyed the Church of St. Matthew in 1812, the image was transferred to the Church of St. Mary in Posterula, and remained there for nearly forty years. There, the image was neglected and forgotten. By divine providence, the forgotten image was rediscovered. 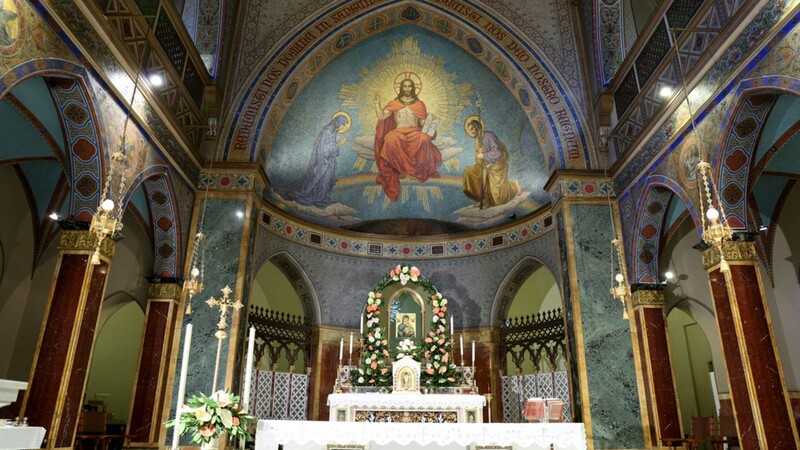 In 1866, Blessed Pope Pius IX entrusted the image to the Redemptorists, who had just built the Church of St. Alphonsus, down the street from St. Mary Major. As a boy, the Holy Father had prayed before the image in the Church of St. Matthew. He ordered the public display and veneration of the image, and fixed the feast of Our Lady of Perpetual Help as the Sunday before the Feast of the Nativity of St. John the Baptist. In 1867, when the image was being carried in a solemn procession through the streets, a young child was cured, the first of many recorded miracles attributed to Our Lady of Perpetual Help. To this day, the Church of St. Alphonsus displays the icon of Our Lady of Perpetual Help and welcome pilgrims for prayer. May each of us never hesitate to invoke the prayers and intercession of Our Blessed Mother in time of need. Prayer to Our Mother of Perpetual Help O Holy Virgin Mary, who to inspire me with boundless confidence has been pleased to take the sweet name of Our Mother of Perpetual Help, I implore You to come to my aid always and everywhere: in my temptations, after my falls, in my difficulties, in all the miseries of life, and above all, at the hour of my death. Give me, O loving Mother, the desire and the habit to have recourse to You trusting that You will be faithful and come to my assistance. Obtain for me then this grace of graces: the grace to pray to You without ceasing and with childlike confidence that I may ensure Your perpetual Help and final perseverance. O Mother of Perpetual Help, pray for me now and at the hour of my death. Amen.